Lancaster PA, south of Harrisburg and west of Philadelphia, is one of the oldest settlements in Pennsylvania. Lancaster, named for Lancaster England, was part of William Penn's original Penn's Woods Charter, founded in 1681. Today, the greater Lancaster area is home to over 500,000 residents. 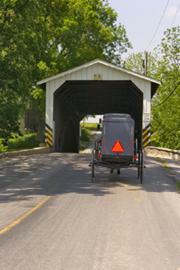 It's an area filled with history, Amish and Mennonite culture, and rolling, verdant green pastures. Famous Lancaster residents have included President James Buchannan; Robert Fulton, inventor of the steam engine; and Milton Hershey, founder of the Hershey Chocolate Company. Lancaster PA has played an important part in American history. Not only was it one of the country's first settlements, it was the temporary seat of government when the Continental Congress was forced to flee Philadelphia when the British captured that city in 1777. During the Civil War, the strong Union defense of Lancaster forced the Confederate troops to withdraw and try an alternate route, ultimately leading to the confrontation at Gettysburg. Fulton Opera House - Built in 1852, the Fulton Opera House is the oldest continuously performing theater house in the United States. The four-story structure is built on the site of an old prison and some believe the building to be haunted. Today, events include theater productions, meetings and lectures, concerts, and recitals. Central Market - Built in 1889, Lancaster's Central Market is the oldest continuously operating farmers' market in the United States. The downtown market, which is listed on the National Register of Historic Places, features a large selection of homegrown and homemade Amish products as well as Caribbean, German, Slavic, and Middle Eastern specialties. Wheatland - The 22-acre estate of the 15th United States President, James Buchannan, "Wheatland," is open to the public from April through October. Displays include rare political artifacts as well as memorabilia from Buchannan and his family. Demuth Museum - This free museum is located in the former house and studio of Charles Demuth, an early 20th century painter. In addition to displays of the artist's work, the museum functions as an education center for students and art scholars. Amish Country - Called the "garden of the United States," Lancaster County is the ancestral home of the Amish in the United States. This fertile countryside is known for its picturesque barns and farmhouses, covered bridges, and Pennsylvania Dutch cooking, culture, and folk art. Area attractions include "Dutch Wonderland," a 32-acre amusement park; Robert Fuller's birthplace; the Sturgis Pretzel House, the oldest commercial pretzel bakery in the US; and the Landis Valley Museum, a living history museum that celebrates and helps preserve Pennsylvania German culture with working crafts shops and displays of homemade wares and implements. Lancaster is easily accessible from the East Coast and from Pittsburgh via the Pennsylvania Turnpike and is a short 40 mile drive from Philadelphia. Area accommodations include a number of charming and historic Pennsylvania bed and breakfast inns as well as modern resort hotels.